Last weekend, I had the honor of volunteering with Heal the Bay with their monthly Nothin' But Sand Beach Cleanup. And had a blast! Meet in the morning, grab your trash bag and glove, and go trash-hunting. It couldn't be simpler. Bonus: There's no commitment. You can do it one time, or do it monthly. Perfect for a slacker like me! Keep your Litter out of the Gutter! Released helium balloons eventually pop and fall back to land, ending up in the ocean where animals mistake them for food. Always pop balloons and put them in the trash. Avoid buying them, or cut them up before you throw them out. Marine animals choke on garbage and get tangled in trash. Unlike people, birds and fish don’t have hands to remove items caught around their necks. Avoid buying products like liquid drain openers. Use pesticides as little as possible and look for non- toxic alternatives. Use compost instead of chemical fertilizers. If you must use harsh chemical products, bring them to authorized household hazardous waste drop-off centers. For locations near you, call (800) CLEAN-UP. Instead of taking plastic bags at the grocery store, bring your own bag. 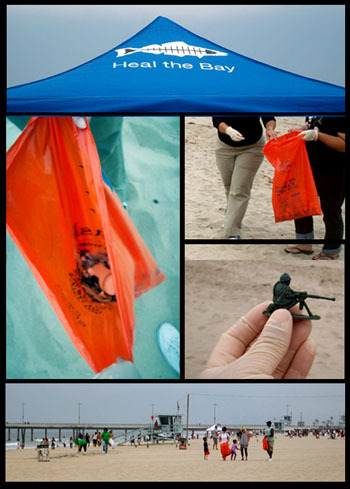 Plastic bags create loads of unnecessary litter; they are easily blown by the wind, and they often end up in the ocean. Plastic takes hundreds of years to biodegrade, and creates hazards for marine life and other wildlife. Use a broom, not a hose, to clean sidewalks and driveways. Watering the driveway won’t make it grow! Sweep trash into a dustpan, not the gutter, and use the garden clippings as mulch to fertilize your yard. You can recycle your used motor oil at gas stations, auto parts stores, and garages. Never pour it down the drain, in the gutter, or on the ground. Motor oil is extremely toxic. Most car washes recycle their water. If you clean your car at home, wash it on the lawn. Use a bucket to conserve water and use biodegradable soap. By volunteering or becoming a member, you’ll help us continue to protect the Santa Monica Bay and all of California’s coastal waters. Live in LA? Looking for something fun to do on a Saturday morning? Want to spend a day at the beach? 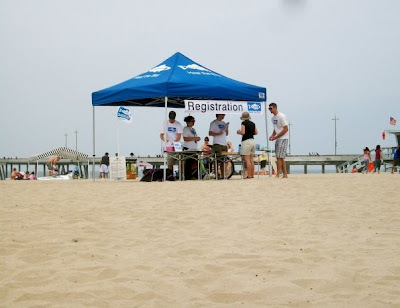 Help out at the annual Coastal Cleanup Day on September 19, 2009.